I’m giving away 3 copies of my book HERE. You have 3 days to enter! Remember that time we made Schnitzel, and I told you to toss the other pork tenderloin from the bag in the freezer? Yeah, I just found it last weekend. I’m cleaning out the freezer to make room for meals for baby time, and I’m putting to use all the frozen meat I found! I have the worst habit of buying the big pack of chicken breasts when I really just need two. I wrap and freeze the leftovers for future meals, which is great, except I forget that it’s in there and buy another large pack of chicken breasts. Repeat three times. Those of you requesting chicken dinners for two, your wish will come true! Pork tenderloin is one of those things my Mom makes for company quite frequently. She wraps it in bacon and fresh thyme and bakes it to perfection. Everyone loves it plain, or on a sandwich leftover the next day. I knew it was time to put a pork tenderloin recipe in my arsenal for company. I have lots of company and guests planned over the next few months, and I plan on making them scaled-up versions of my Dinners for Two. After baking all day, these are really the only kind of dinners for which I have the time. This one-pound tenderloin serves two quite generously, maybe even three people. I’m not a huge meat-eater (but gimme all the crispy veggies), so in your house, it may only serve two. The recipe below is for one tenderloin, but you can easily scale it up and put as many tenderloins on the sheet pan that will fit. We haven’t even talked about my favorite part: crispy veggies. I feel like it makes me a boring person to admit that cauliflower is my favorite vegetable, but it’s true. I credit my addiction to Indian food for my love of cauliflower. I always have a head in the fridge during the winter. Heads up: buy the whole head instead of the already-cut florets so that it will last up to 2 weeks in your fridge. Or not—buy pre-chopped florets the day you want to make this and save yourself the mess! The vegetables roast right on the same pan as the pork (but come out after 15 minutes). It’s perfect because you need to check the temperature of the pork at 15 minutes anyway. I always cook meat in the oven using a thermometer—it’s the best way to be 100% of your results. 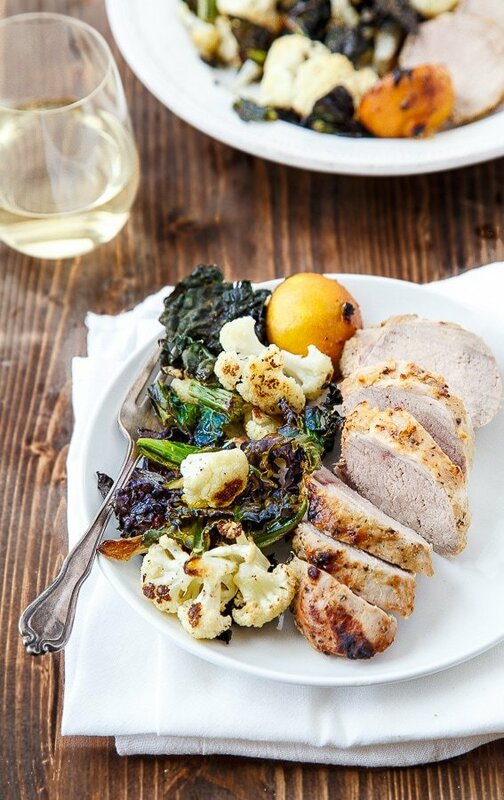 RECAP: tangy, moist honey-mustard pork with roasted cauliflower and crispy kale bits showered in Parmesan cheese. Is it a yes? I think so. In a large re-sealable bag, add the mustard, honey, garlic, olive oil, salt and pepper. Squeeze the juice of the lemon in the bag too, and then add the whole lemon. Smush to combine. Add the pork tenderloin and use your hands to ensure it's evenly coated with the marinade. Let rest in the fridge for 8 hours. Preheat oven to 500. While the oven preheats, remove the pork from the fridge. Roast the pork (with the marinade, including the lemons) on the pan for 20-25 minutes, checking the internal temperature at 15 minutes. I like a hint of pink in my pork, so I take it out of the oven at 145, cover it in foil and let it rest for 15 minutes before slicing. Squeeze the roasted lemons on top before serving. 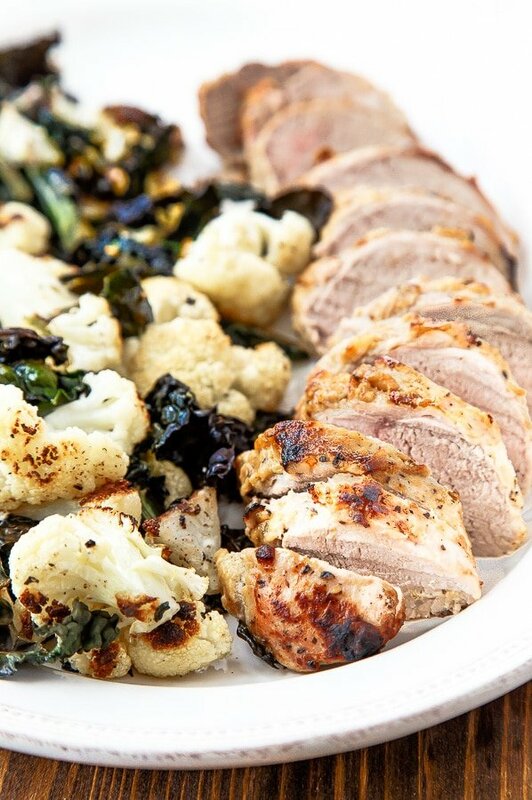 On the same pan as the Pork Tenderloin, toss the vegetables with the oil, salt, pepper and nutmeg. Roast for 15 minutes, and then remove the vegetables from the oven to a serving dish. Stir in the Parmesan cheese, and cover to keep warm. All my favorite things right here! YUM! I eat the worst dinners. Everyone thinks us food bloggers eat fabulous meals all the time. But after cooking all day, by dinner time I just scrounge around. So it definitely has to be easy peasy for me to make something. Have a great weekend, girlfriend! I didn’t know pork could be so darn beautiful! Frame this baby. Love an easy-to-make dinner, AND crispy veggies. Yours look amazingly delicious! I love this meal! 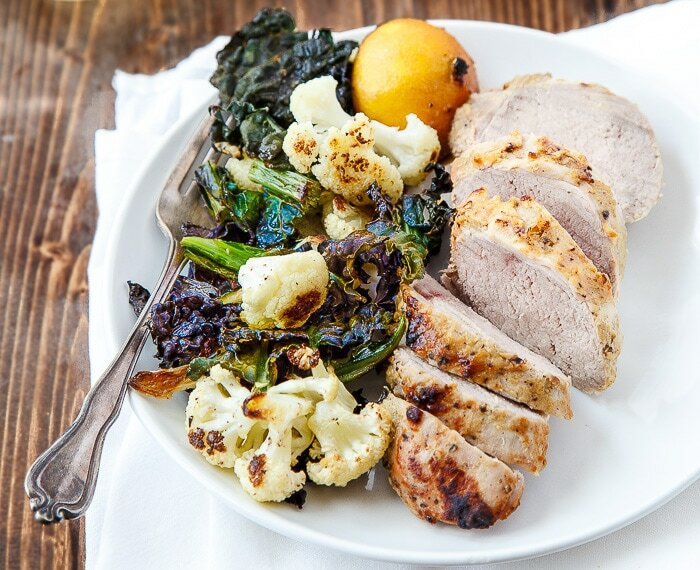 I love making pork tenderloin, it’s so easy and fast! The flavors you added to this are perfect and I can’t get enough of some delicious crispy cauliflower! Beautiful meal! Looks so flavorful! Have to try making my own honey mustard! It’s funny, when it comes to frozen food I forget about nearly everything in the freezer except for meats and veggies. Frozen cookies, ice cream, and other amazing things I somehow forget about (probably because how the heck did I exert enough self control that there are any left!?). As for frozen chicken those big packs never seem like enough because I go through it so fast! Guess I should take that as a hint to use the other meats… anywho I love making my own honey mustard and this sounds right up my alley. Crispy veggies for everyone! Beware that pan of roasted broccoli. You will never actually make it to the dinner table. Oh, this recipe. Top to bottom. WANT. Yummy!! That looks and sounds really good and tasty! I am excited to have your Desserts For Two cookbook. Is it possible to substitute Splenda for some of the sugar? This looks amazing, Christina! 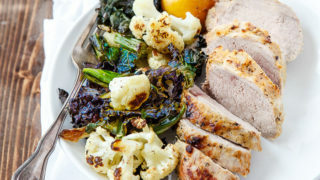 Love the honey and mustard flavour with the pork – such a classic combo! Need to try the recipe soon, so tasty! I would happily eat this 3 nights in a row – extra cauli and kale, please! P.S. Your photos just get better and better! So inspiring! Amaaaazing recipe! Loving the honey mustard in there and I totally agree that crispy vegetables are where it’s at. They’re SO good. Thanks for reminding me to buy some cauliflower! I’m new to your blog and I LOVE IT! Finally I can make recipes that we don’t have to eat for a week (or longer)!! I can’t wait to get my hands on your book too. I unfortunately cannot stand to eat the incredibly popular vegetable that is kale. Is it ok to substitute spinach for the kale, or would you recommend another vegetable instead? Thanks! Hi! Nice to meet you :) and thanks for the kind words! I think spinach would burn, sorry. Maybe just all cauli? Best of luck! –I didn’t get a nice crust on the top like your photo…did you sear it first or broil at the end or something else? –I added the marinade to pan with foil as suggested. It all burned off and blackened the foil (lots of smoke)…anything you’d suggest to do differently? –Are you supposed to let the veggies get some of the marinade in them since they are on the same pan or try to separate? Thanks! You know, this happened to me, too, but I just couldn’t decide if I should have the recipe call for leaving off the marinade. On one hand, it burned on foil so it was easy to clean up and probably contributed flavor to the pork. On the other hand, maybe it didn’t contribute flavor? Hmm. Anyway, sorry I didn’t warn you this would happen. Everyone keep telling me it’s happening to them too, so maybe I should warn people or update the recipe? I didn’t do anything special to get a brown crust, except maybe sacrifice taking the pork a little past pink. See how it’s almost pure white in the photos? Normally I like my pork slightly pink, but I wanted the crust. I cook with a super hot gas oven, that could be why I had a crust. If your oven doesn’t make a crust, try sticking it under the broiler for a few minutes? I just realized I accidentally bought pork loin rather than tenderloin. Ahhh! Do you have any tips for me, now that the main dish of my course has been altered? Great dinner for my husband and I. And two slices leftover for his next days’ lunch. Great flavors with the cauliflower(I didn’t have any kale.). Puzzled… Fixed it last night and loved the roasted cauliflower..but my kale was blackened. Suggestions to improve next time please??? Oh no, Mary! It sounds like the kale was chopped too small and might have cooked too quickly in the oven. I’m sorry! I made this last week and it was so good! I didn’t have much time, so I only marinated it for 6 hours – still delicious. I also made a honey mustard sauce for my almost 2 and 3 year olds (and husband) to dip in. My oldest is not really a meat eater and actually took a couple bites of this and said he liked it. Next time I’ll probably reduce the extra marinade on the stove for a sauce instead of pouring all of it over the meat. I think this is the first time I’ve made one of your savory dishes, it will definitely be in our dinner rotation.